Over the last few months, there have been plenty of waterfalls added to the database thanks to a solid roster of explorers that have been submitting their finds to the database. Huge shoutout to all of them! Today all those, as well as some others, are now added to the waterfall map, hooray! The database is now up to 550 waterfalls, of which 539 are on the waterfall map. Speaking of the waterfall map, now if you zoom in far enough, the lidar will appear. This means you can plan your journey around cliffs and see the terrain in more detail than ever before. Maybe even find a waterfall that is yet to have been added to the database! This feature most likely will be tweaked, updated and added to as I receive feedback. So feel free to reach out to me if you would like to see it displayed differently, more options, or added to in some way. The Top 10 County list has been updated several times since it made its debut. Laurel County is still rocking the top spot. There is also an update to the Top 10 Tallest waterfalls in the state. I had the pleasure of visiting and measuring a new champion, Crabtree Falls. Pictured below, it is a real beauty of falls and stands at 145' tall. If you haven't checked out the new search feature, I would recommend doing so. 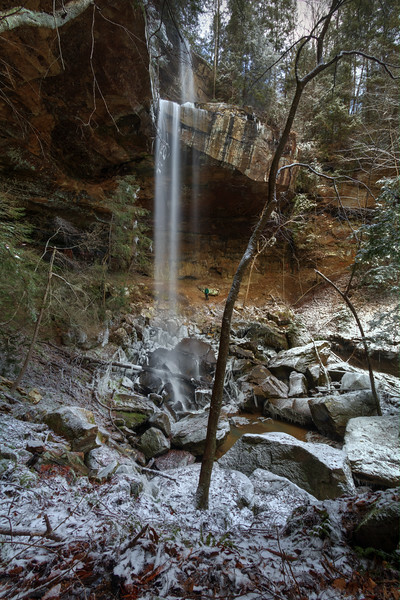 Lastly, if you do not like to find your own route to a waterfall, and would rather follow a guide, please check out Explore Daniel Boone National Forest created by my friend Adam Thompson. I have submitted a couple trip reports for his site and have more in store. It is going to be the best resource for hiking and exploring in the Daniel Boone National Forest. I highly recommend bookmarking it and using it as a valuable resource. I have created a new top 10 list. This list is for the counties with the highest count of confirmed waterfalls located in them. The data is somewhat skewed as the list generally includes counties that I personally have spent a good deal of time in. Other than Kenton County, it could be said the reason the other counties are on this list is that they actually do have a lot of waterfalls and I personally visited them often over the years. Kenton County is not a waterfall county but is the county I reside in and hence I have found or located more waterfalls than I otherwise would have. The following is the list of the counties with the most confirmed waterfalls currently in the database. The list was created on 1-4-2019. There is now a search function on the website to help find specific waterfalls if you have the name. Top Left corner and then down that menu at the bottom. Try the new search feature. The website is now updated to 534 waterfalls. The waterfall map now stands at 508 waterfalls.